← Easy Money – Yes, But Not Where You Think. Dire. That’s the word used to characterize the U. S. debt crisis these days. Our total debt will reach $14.3 trillion this month and the federal deficit for this year alone is estimated at $1.6 trillion, the highest ever. What’s going on and what’s the answer? To understand the debt a very fundamental aspect of our market-driven economy must be understood – the boom-and-bust cycle. If you don’t understand this you are not qualified to complain about the debt crisis. Essentially a free capitalist system has a built-in trend-amplifying feedback loop. By this I mean that when we are in a growth phase there is an artificial boost to the growth pressures driven by high returns and speculation. So, for example, when the housing market is soaring, as it was in the late nineties and early half of the 2000’s, lots of speculative money flows into housing, increasing prices even beyond normal. People take on more debt or buy and turnover multiple properties to make fast money. The same thing happens in other sectors – dotcom companies, or tulips (in 17th century Holland) to name two. This is a classic bubble or boom. The opposite happens during the downward part of an economic cycle. Now the trend-amplifying feedback loop accelerates the downturn. As valuations fall people default, sell in panic or get their margin calls causing an acceleration of selling. Companies retrench and the contraction feeds on itself. A classic bust or bubble burst results. We’ve had two big ones in the last 20 years – the dotcom burst (cost $2 trillion) and the gigantic tsunami of 2008, the financial meltdown (cost about $10 trillion!). Economists have long understood this fundamental instability in a free market system. This is one of the flaws with capitalism, which in general is the most efficient way to allocate capital and engender competition, but has side effects and quirks that must be managed. Two quirks that all rational analysts agree need active controlling are a tendency for companies becoming too big to fail (or too big to need to compete) and the boom-and-bust cycle. The solution for the former has been to not allow monopolies and the creation of antitrust laws. The solution to the boom-and-bust cycle has been Keynesian fiscal action by the Federal government to cancel out the self-amplifying and destabilizing feedback loop that causes bubbles and crashes. Keynesian economics requires that when the economy is forming a bubble the federal government should take actions to keep it from overheating. This can be done via Monetary policy (actions by the Federal Reserve, such as increasing interest rates and making capital more expensive) or through Fiscal policy (raising some taxes, decreasing government spending etc.). The reverse should be done when the economy is in a bust mode to prevent a painful and sustained recession. Taxes must be lowered in the teeth of lowered revenues and spending must be increased even when we are facing large deficits. If we don’t understand this and take the wrong actions we can greatly exacerbate the cycle and cause havoc. In 2000 at the tail end of the Clinton 8 years we had had a classical boom cycle. The economy was growing at a phenomenal clip – 22 million new jobs had been created in less than a decade and we had a budget surplus. Federal tax collection had jumped to 20.6% of GDP. See my previous post for more. The dotcom bubble was forming and the stock market had soared. The NASDAQ index stood at a vaporous 5050 – almost twice what it is today, 11 years later. This was a time where Keynesian economic prudence would suggest we needed to put some brakes on. In came the Bush administration. The new President said that the surpluses meant that we could return a dividend to the people and cut taxes. He didn’t do the recommended Keynesian thing which would have been to keep the surpluses and reduce overall federal debt when the economy did not need a boost. He also increased government spending enormously by initiating major wars and implementing expensive social policy such as the drugs program in Medicare. So we had a big time deficit – a stimulus even as the economy was being artificially boosted by war and unneeded profligacy. 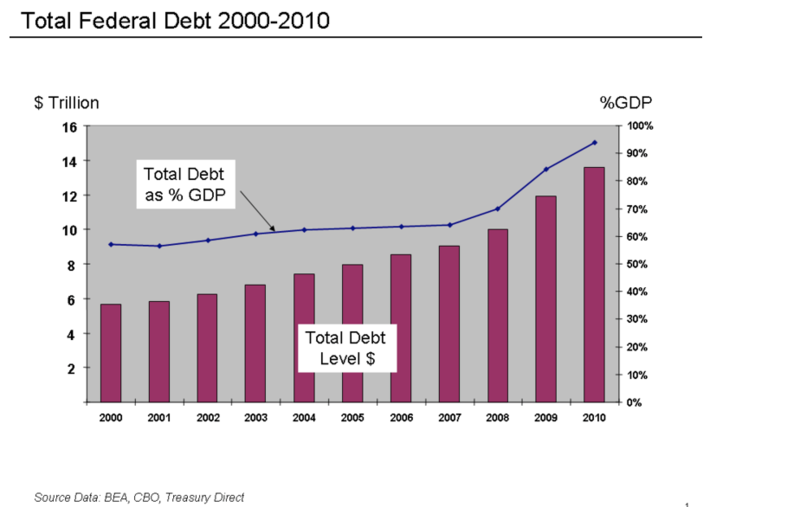 Our debt started ballooning during an expansion, leaving us less margin when we would need to deficit spend in a crash. We were belt-expanding when belt tightening was needed! About $6 trillion of excess government debt and spending was created during an expanding economy to pump even more air into a bloating bubble! When this horribly bloated bubble burst (as they all must, for trees don’t grow to the sky) it was cataclysmic. The speed with which the financial system collapsed was breathtaking – institutions such as Lehman Brothers, AIG, Merrill Lynch etc were bankrupt. Banks such as Citicorp, Deutchebank, Bank of America had negative net worths in the trillions! If nothing was done the consequences would be a wipe out of virtually the entire financial system – peoples’ savings decimated, pension plans destroyed, mutual funds with hugely negative values, corporate debt defaults resulting in major bankruptcies of blue chips like GE and not so blue chips like the S&P 500 companies. We had a debacle where we ran the risk of a once-in-a-century depression – maybe 30% unemployment and even breadlines! In such a situation only the Federal government could avert catastrophe. They had to act fast and there was no precedent to guide them. Within a matter of hours the government had to inject huge amounts of liquidity into the system to arrest a free downfall. They didn’t do it with skill and finesse – how could they, no one knew what to do? But they did manage to arrest the free fall. Many large institutions were indeed saved and banks rejuvenated. But all this came at a great cost. Tax revenues had fallen by more than 30% because of the crash and spending had to be increased, first to avoid financial havoc and secondly in welfare expenditures such as unemployment benefits. So now we have this ginormous deficit, to use the vernacular. But what caused it? Certainly not the actions that we had to take to get out of the train wreck. No, the debt crisis is a result of previous administrations’ actions that allowed this huge bubble to form and the $10 trillion bust that ensued. What should we do now? Well, firstly, all options available to us will have a cost. We have to pay for the unpaid splurge that the financial sector enjoyed. Who will pay is what we must collectively decide. Our economy continues to be sluggish as we are coming out of the crash slowly. At this stage we should continue some stimulus (as Nobel prize winning economist and an expert on recessions, Paul Krugman, convincingly argues) and lowered taxes even at the expense of a larger debt. Obama is right in not raising taxes right away. In fact he has quietly executed a huge Keynesian boost by cutting the payroll taxes for two years. Payroll taxes are the largest component of taxes right now and provide the largest economic fillip. We have a huge deficit right now. No question about it. At $1.6 trillion it is the largest this country has seen. But the fact is that 60% of this, or about $950 billion is lost revenues because of the deep bust and the rest is forced spending in the worst recession of our lifetime. This is not to say we don’t have waste in government spending – but the wrong-headed actions that led to an oversized speculative bubble followed by a horrible bust are the biggest catastrophe that we have suffered. If we really feel that our debt crisis is dire we ought to take steps as outlined above instead of playing debt-ceiling chicken while spouting ideological nonsense, as our clueless Speaker Boehner and his zealots in Congress are doing. The stakes are indeed dire.